In contrast to our dive trip last month where we wallowed in luxury, this time we went to camping. Rugged, spartan and remote – well, gonig to a place of beauty is never without challenge! As early as May last year, Angel and I got our San Jose tickets. I was in the mountains of Bukidnon for rural dev work, still mourning for my mum’s demise when he encouraged me to avail of the seat sales, we wanted Coron but ended up with San Jose after it was being sold out! It wasn’t in my list to visit Apo as I know the usual access to the reefs is through liveaboard – which is too pricey! The site though is too interesting to ignore. Unmindful of sudden changes in itinerary and after nine months have lapsed, Angel made last minute arrangements for the dives as we are exploring the reefs through the Local Tourism Office of LGU Sablayan. It would be a long trip for me and I was resolute that we must have not less than three descents – I need more value for my money spent. So, Angel and I decided to divert for land trip to Sablayan instead of our flight to San Jose. Left Manila almost 10pm for Batangas pier with Angel and Alfred (another diver joiner) for about two hours, from then on we took the ferry for Abra de Ilog for another more than two hours. It was all dark and didn’t get a glimpse of the view as we went with the crossings – except for the last quarter moon rising in dawn. Then we sped off to Sablayan in an aircon bus and arrived at the Local Tourism Office at daybreak about 6am. 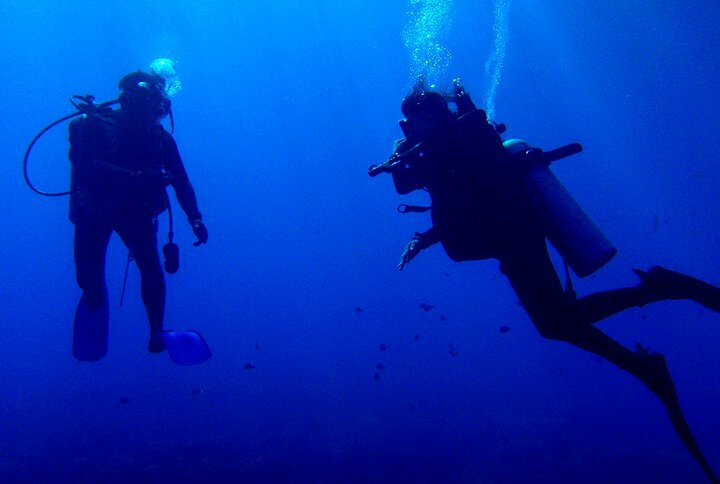 We just need to rush things as we need to maximize time to make three dives in all. So after arranging our gear and equipment needs and settled our bills with the tourism officer, Angel and I rushed again (with Alfred) to the local market to buy our food and other needs in the island, we had to do it quick so we could leave for the island not later than 8am – we had a long list of stuff to buy! We did it though in an hour crossing the aisles of the market, we were impressed that plastic bags were not provided for your stuff – the LGU is adopting the policy of MOB. A responsible move of the local community for the good of the environment. Finally, we hit the shores for our paradise island with big smiles on our faces. The bright sunny horizons just perfect for our waters escapade! Ah, the smell of the sea waters is so refreshing – I belong to the waters, indeed. 🙂 Somewhere in the mid of our cruise, there was some stirrings in the waters ahead of us and came jump a giant trevally! Wonderful sight to behold – I took it as a good sign of welcome for us to the reefs. Approaching the island we passed through the submerged reefs which made the waters turquoise, beyond we watched the glorious panorama of white sand beach all around penned in by verdant mangroves and the lone slender lighthouse. After more than two hours on the waters, we finally docked on the white sands near the front of the Ranger Station. Days before this trip, my mind has been wandering about Angel’s sharks encounter while snorkeling – I was awed with the idea of seeing sharks on shallow waters! I love macros – critters are interesting but in the end didn’t we all become divers to see the big stuff? And let’s be honest, nothing gets the blood flowing like the larger marine species! 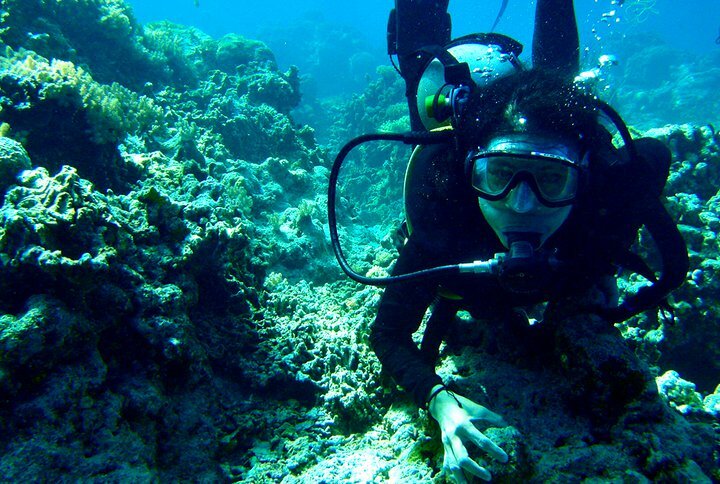 It felt like ages while waiting for the refill of our tanks, I’m dying to go unto the depths – my second home. And we wanted not to waste our precious time, we need the three dives – by hook or by crook! 😛 Our first descent was south of the island, and our first sighting as we observe the wall was a big lobster perched on a crevice, its antlers waving with the current. Then another lobster a little farther, the wall was decorated with sea fans and gorgonians in varied colors and sizes. The site was punctuated with colorful tiny nudis as we inspected the reefs. The highlight of it was the silver tip shark below us – about three feet! We had a good vantage watching him as it swam coyly perhaps searching for a prey. We wanted to get near, went down and up giving me a bad profile. There were tropical species – wrasse, fusiliers, damsels, anthias, mandarins, anemone, and lot more. Its biodiversity is commendable. We spent our safety stop on a sandy area with lot of colorful corals. 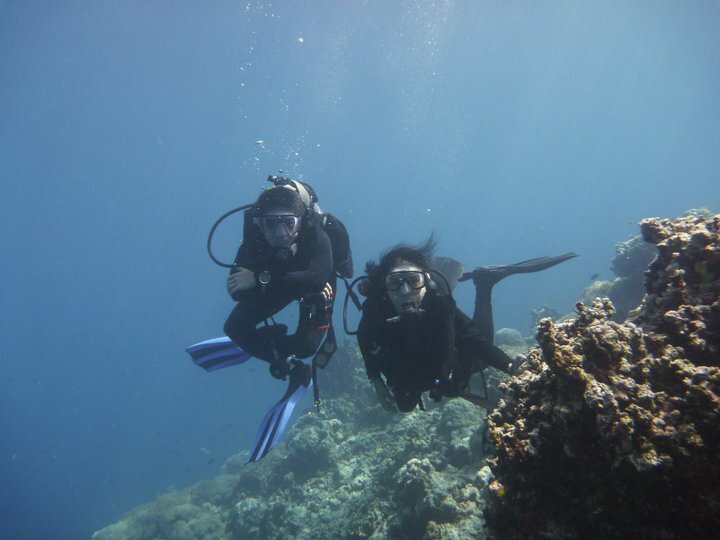 This is diving, this is life! Our late lunch at past 2pm serves as our surface interval while having the boat used for snorkeling by our travel friends. It was already 3:3opm when we had our second descent at the north side of the island. 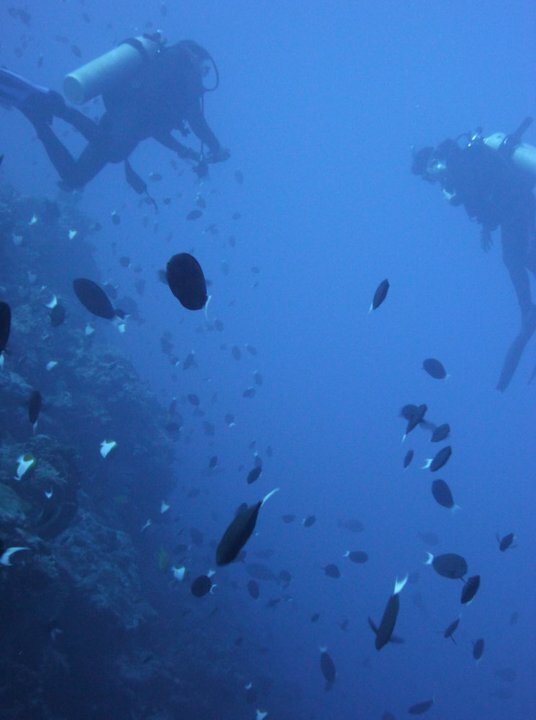 WE descend on a slope with tropical fishes, soft & hard corals, basket sponges, anemones and few crinoids. We spotted a turtle which we tried to follow, but sadly he was disturbed with our persistence to get near him. He tried to swim past away and hid on the crevice on the reefs. We sighted too groupers, damsels, wrasses, butterfly fish, anthias, surgeons and snappers. I think I sighted also bluefin jacks or trevally. We ascend after 46 mins, my air still at 1200psi. During our surface interval, we make use of our time preparing and setting up to cook for dinner. The late afternoon winds getting harsher almost blowing our stuff including the pitched tents. The calm pinkish skies on the horizons beckoning the setting sun, at 5:48pm it was almost dark when we had our last and third dive at the reefs. It was almost a night dive 🙂 , making sure we wont caught up in the dark we brought our torches. We went out to explore southwest of the island. A soon as we got to the waters, DM Albert urged us to descend immediately as there were school of napoleon wrasse nearby below us. It was another great display of marine life, right there swimming coyly before us! There were fusiliers, snappers and groupers too. Then there was the big hawksbill, a pleasant surprise for us! We got the chance to get up close, playing with him. This time we move slowly going with him, reached out and unexpectedly able to pet him – touching him right there in his habitat! We sighted again the school of Napoleon wrasse twice more in different direction. We explored more, there were sea cucumbers which I tried to touch. There were crinoids, I got stuck with a green feather star as I stayed close to the bed getting around. Then as we are about to end the dive, we were treated with another display of pelagics – a school of humphead wrasse swimming coyly before us. Indeed, it was already dark when we ascend at 6:34pm with my air still at 1500psi. From deep under we went high up the island through the lighthouse the next morning, which I discovered funded by a loan from OECD. It has a viewing deck that offers 360 degrees view of the island, unfortunately there was strong winds when we got there. There’s mangrove forest amidst the stone cliffs which looks like miniature of limestone cliffs in Coron. It is important to the island’s ecosystem as it serves as spawning ground and nursery for marine species. The blue waters beyond, the white cottony wisp of clouds in morning skies, green mangroves – all so natural and beautiful! The strong winds didn’t encourage us to stay long above the tower, so Angel and I get back ahead from our friends for our breakfast preparation. We sailed off for our return trip to the mainland after our breakfast, not wanting to leave without getting into some action on our departure. We snorkeled somewhere in a spot where corals are dead, but it didn’t disappoint us. We were greeted by school of blue fusiliers shining brightly against the morning sunlight. Then a turtle appeared almost with same color of the corals, crawling on the bed perhaps looking for food. Then a white tip shark appeared wiggling directly beneath us, we watched in awe but can’t get nearer. 😛 Then the sea turtle appeared again, the blue fusiliers still near us. It was beautiful, it was such pure bliss. For the nth time I felt humbled with the exquisiteness of creation! 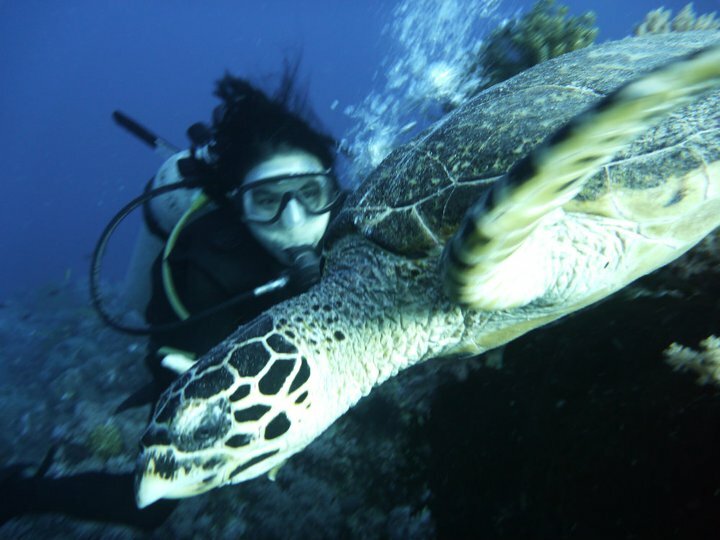 Pingback: Puerto Galera Galore « Life Beyond the Depths!